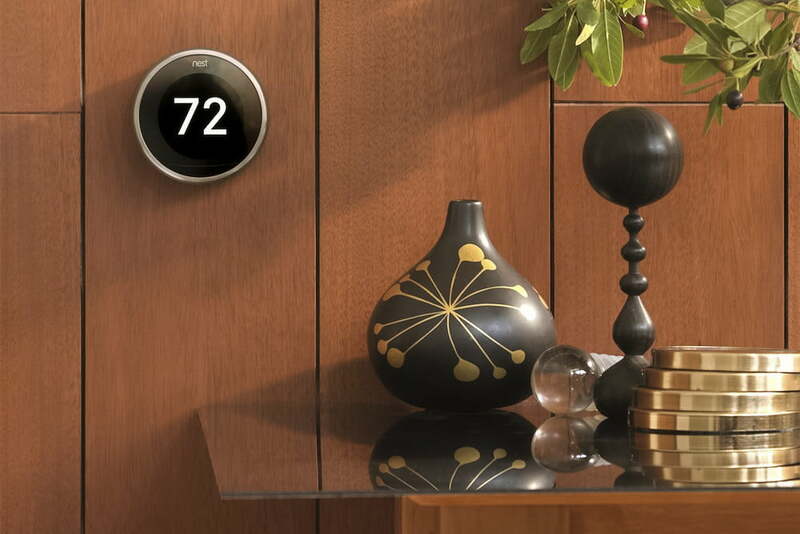 The Nest Learning Thermostat jump-started the smart thermostat market over a half decade ago. These days however, Nest isn’t the only game in town, and the competition is fiercer than ever. Nearly every major thermostat manufacturer now has a smart model, and prices have dropped to a point where any homeowner can afford them. Of all the smart home devices, the thermostat potentially has the best return on investment. Optimizing your heating and cooling can turn into real savings over time. They learn your daily schedule, can adjust the temperature of individual rooms, and anticipate heating and cooling needs based on the weather outside. You can even control your thermostat away from home through an app. But even with more affordable options, the cheapest isn’t always the best. Below are a few of the best smart thermostats. Why you should buy it: Now in its third generation, the original smart thermostat still is the best of the best. We really like the Nest Learning Thermostat because of its learning capabilities. After you install the device and set the temperature you like, the thermostat does the rest. Nest takes note of how you move around your house throughout the week, adjusting the various temperature settings according to the time of day and your habits. With the third-generation model, a new set of sensors called Farsight make this even more accurate. Farsight detects when you enter a room or walk past it up to five meters away, a significant improvement over earlier models. Additionally, up to 10 additional sensors can monitor temperatures in other rooms, further optimizing your heating and cooling. You can monitor temperature from a much further distance thanks to a 3.25-inch screen, a half inch bigger than previous models. Like any good friend, the device will offer suggestions designed to save you money. Its ability to adjust the temperature of your home a half hour before you arrive from work only furthers its intuitiveness. 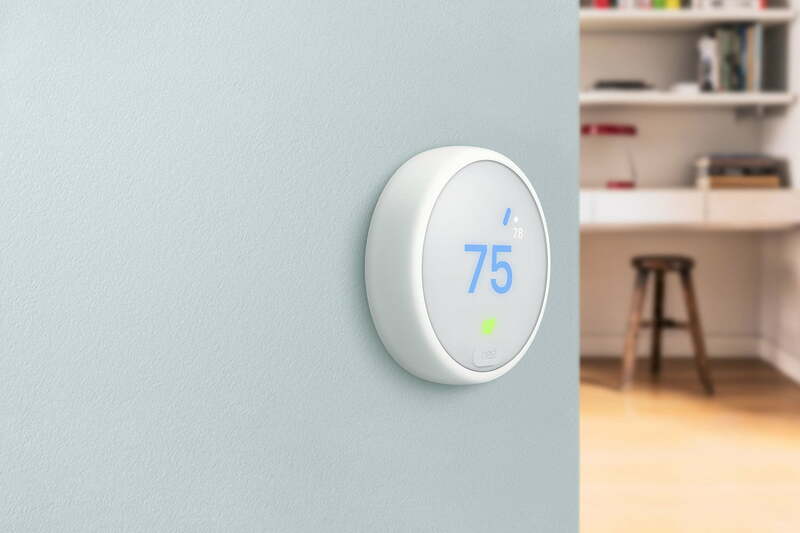 Thanks to ‘Works with Nest,’ the thermostat integrates with a lot of other smart home products, allowing you to create scenes, like bedtime: Your lights turn off, the door locks, and the temperature lowers. The latest version also works with Amazon’s Alexa and Google Assistant, so you can tell it when you’re too hot. Why you should buy this: Can’t afford the Nest Learning Thermostat? Nest has another option for you. Who’s it for: Budget-conscious buyers who still want lots of functionality. Nest was seeing a lot of price pressure from its competitors after nearly a half decade at the top of the heap, and that’s likely one of the main reasons the Nest Thermostat E came about. Cheaper than the Learning Thermostat, it retains a good deal of its functionality at the same price point as most mid-range competitors, even though Nest has ditched the iconic metal enclosure for cheaper plastic. That’s not to say it looks cheap. If you have white or light-colored walls, the E blends in. The choice to place a diffuse plastic film over the screen gives an almost watercolor-like effect to the display, maintaining its overall subtleness. You won’t get Farsight or some internet-connectivity features, but to be honest we don’t think you’ll miss them. You’ll still get the learning features of the more expensive models. It works with other Nest and third-party devices. We firmly believe (at least right now) that the Nest Thermostat E is the cheapest smart thermostat out there that is actually worth buying. Why you should buy this: Don’t want to buy an Echo? This thermostat has Alexa built in. Who’s it for: Anyone looking to add voice control to their smart home. Ecobee3 was one of our previous favorites for large homes, as it allows you to add up to 32 (no, that’s not a typo) sensors to monitor conditions in large spaces. The Ecobee4 is essentially the same thermostat in functionality and design, but with an important addition: Amazon’s Alexa voice service. This makes the Ecobee4 an especially good deal. It’s almost like getting an Echo for free considering $249 seems to be the go-to price for high-end smart thermostats these days, and an Echo can be anywhere from $50 to $230 more depending on the model you want. If Alexa doesn’t tickle your digital assistant fancy, both Google Assistant and Apple HomeKit support is available too. Where Ecobee still feels a step behind is in its learning capabilities, which is the reason why we’ll still give the edge to Nest. Yes, Alexa is a good feature, but you need to remember that the speaker itself is pretty small and on the back of the device, making it okay for voice queries but not an option to listen to music or anything like that. We would recommend this unit over the Nest to those who might not already have an Echo. Digital assistant technology is one of those things that you just don’t know how convenient it is until you’ve tried it. Putting it in a thermostat is a pretty neat idea, since it’s always located in a central spot in your home. Why you should buy it: Honeywell has been in the thermostat game a long time, and the Lyric was the first smart thermostat to take on Nest. In a nutshell, the Honeywell Lyric taps into your location and local weather forecasts via Wi-Fi. The circular device will then anticipate potential temperature changes and compensate for the weather, while offering a host of shortcut settings for straightforward programming and operation. The thermostat features three standard modes — one for when you’re sleeping, one for when you’re leaving your home, and another for when you’re arriving — all of which you can adjust using the mobile app for iOS and Android devices. The device will adjust accordingly to save you the maximum amount of money, but if you prefer to work outside the box, you can set custom settings to fit your household. Honeywell makes three of the five thermostats that work with SmartThings, including the Lyric. Much like the new Nest, it works with Alexa, but it can also work with HomeKit, which something we can’t say for Google’s Nest thermostat. Why you should buy it: Excellent air monitoring and amazing controls meet broad voice assistant compatibility. Who’s it for: Anyone who really wants to show off their thermostat while also keeping tabs on both indoor and outdoor air. Looking for a smart thermostat with the most features and flashiest tech? The Glas sets out to impress with a translucent OLED screen, incredible interface and app for control options, and a general design that looks about 100 years ahead of its time. However, as we noted in our review, the Glas has a great design, but many of these features only reach skin deep. It’s actual thermostat features are more on par with what the rest of today’s smart thermostats. The Glas offers schedule programming, occupancy sensors to detect people and set automatic schedules if you want, and compatibility with Alexa, Cortana, and Google Assistant. This compatibility includes built-in software, so you can actually talk to these voice assistants on the thermostat like Ecobee allows, although the quality won’t be as good as a dedicated speaker. One of the most unique (although not unheard of) features Glas bring is indoor air quality monitoring to check not only humidity but also VOCs and CO2. Combine this with outdoor air quality reports on allergens, sunlight and air quality—which Glas also provides—and you’ll have a great idea just how healthy your air is. The best thermostat for the U.K.
Why you should buy it: Plenty of common-sense features for managing energy use, and a great interface. Who’s it for: Energy-conscious people with water heaters, on either side of the pond. The Active Heating 2 kit includes both a thermostat and a hot water heater module for specifically controlling your hot water heater action, so it’s not constantly on. It’s an deal solution if you want to control your energy use as much as possible to save money, wear-and-tear, and planet earth. The devices, via an excellent control app, allow you to set six time slots for heating and hot water, scheduling how they behave at different times of the day based on your family’s activities (there are also a number of presets for common daily lives to make things easy). Meanwhile, the geolocation features mean Hive can warn you if you’ve left while the heat is still on. The mobile thermostat (you can easily perch it on a nearby counter or table) is also compatible with Google Assistant and Alexa for giving voice commands, and allows for multizone compatibility if your home has multiple heating zones. The Hive hub also works with other smart devices, if you don’t already have a preferred method to control the other parts of your smart home. In other words, it’s an incredibly practical smart thermostat that’s well-suited for the daily life of the average family. And—good news for American buyers—Hive is bring its thermostat across the ocean to sell here as well. Smart thermostats aren’t just about how well they regulate temperature; they’re also about saving money and changing temperatures at the right time. When we test them, we take into account several factors, including ease of installation, ease of use, how well they do their job, and whether or not we saw any cost savings during testing. There’s always a learning period with smart thermostats, so we take those into account and then see how well they do at tracking our comings and goings. Thermostats are often seen as the center of smart ecosystems, so we also test their integrations with lights, locks, and other devices they’re compatible with. With the addition of compatibility with Amazon Alexa, Google Assistant, and Apple HomeKit, we also see how well the thermostats do with voice commands. Overall, we’re looking to see how well these thermostats do with cost savings and how often we have to interact with them once they’ve supposedly learned our habits. If we’re unable to test a thermostat ourselves, we do our best to scour the web for other reviews and information, so we can provide you the best recommendations.